Mich is Director of Music at Finchley Reform Synagogue, and until recently conducted Brentwood Choral Society and The Just Kidding Chorus (for parents with little ones). She previously conducted Diversity Choir, as well as student choirs at Roehampton University and the Academy of Live and Recorded Arts (ALRA), where she also taught choral singing and musicianship. In 2010-11 she was awarded the Association of British Choral Directors apprenticeship to work with Wimbledon Choral Society and its director, Neil Ferris. She has been Musical Director for theatre productions at Chapel End Savoy Players and ALRA, as well as for independent productions. 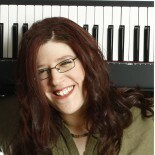 Mich can deliver workshops to choirs on the topics of choral blend and choral charisma, or sessions to introduce new repertoire such as Jewish music, songs from around the world, or fun, accessible pieces for mixed ability groups.